I had such high hopes for this film. Director Gareth Edwards’ last film, Monsters, had broadly the same plot and I had expected the sensibilities that fuelled that film to come in to play here. That movie was about gigantic creatures roaming the planet, laying waste to our fragile man made world but it differed from other films of this nature in one important way. It was far more concerned with the people than it was with its gargantuan creatures and was actually a beautiful and subtly moving little character piece. I assumed then, that when they gave Edwards control of Godzilla, it was very much on the back of Monsters. What Warner Brothers wanted was to have a big budget blockbuster with the heart of an intimate character driven indie picture. In the interim we had Guillermo del Toro’s similarly themed Pacific Rim. That film seemed to stand as a cautionary tale in that it showed how given a big enough budget even one of the most imaginative and creative fantasy directors in the history of cinema could turn out a total dud. It was going to be different with Edwards though, he was going to be able to take an outlandish and fairly ridiculous set up and make it seem real. He was going to do with Godzilla what Christopher Nolan had done with Batman. This wasn’t going to just be another loud and stupid monster movie. I think you can see where I am going with this. Godzilla is just another loud and stupid monster movie. Come back Roland Emmerich, all is forgiven. Let’s start with what was so good with Edwards’ previous film. 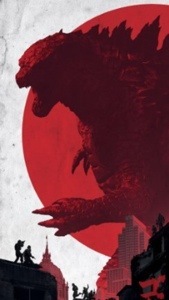 The first hour of Godzilla also concentrates heavily on the people caught in the middle of the carnage. Edwards has certainly gathered a great cast with Aaron Taylor Johnson, Elizabeth Olsen, Brian Cranston, Ken Watanabe, Juliette Binoche, David Strathairn and one of my favourite actors, the wonderful Sally Hawkins. Unfortunately they are asked to play out a series of cliched and predictable scenes with very little evidence of real human reactions. What we get instead is scientists who did not realise the true power of what they were dealing with, the crazy old man who might actually be the only one to really see what’s going on and the young couple with a small child who are separated by the awful events but will find their way back to one another, no matter what nature puts in their way. Stop me if you’ve heard this one before. The performances are generally fine, although Watanabe as the obligatory token Japanese guy just frowns a lot and all of them are far too accepting of the incomprehensible events playing out before them. (This is something that Monsters and Pacific Rim got right, introducing us to the characters when they had had the chance to come to terms with the titans among them.) The problem is that the story doesn’t give us anything that allows us to connect with anybody. In terms of the story though, this is the least of the film’s crimes. The plot is so full of holes it just cannot hope to hold together. Events are driven on by such a series of ridiculous occurrences that it makes Prometheus look as tightly plotted as Memento. I could go on about this for another 1000 words but, in fear of spoiling the movie more than the film makers already have, I will raise a few points to give you the general idea. First of all and early on we have a radiation leak in a nuclear power plant. Said leaking radiation forms a cloud and then proceeds to move down the corridors at a pace that allows people to run away from it. Now I’m no physicist but I’m fairly sure that such a phenomenon would not move around a building like its The Blob. That seems pretty stupid to me. I have struggled with shots of people out running fire in movies for years but this one is just too much. Then there is the moment when a largely submerged Godzilla jets through the ocean, his Stegosaurus back plates above the water like Jaws. It isn’t just that I see nothing in this monster’s physiognomy that would allow him to swim at such speeds, it is the way he capsizes battleships left, right and centre but inexplicably avoids the one with the principle cast on board. Why would he do that? Why dive underneath it only to come up again to continue the destruction. It is totally contrived. Also, if the big lizard is hunting as we are told, why does he show no interest in eating his prey? 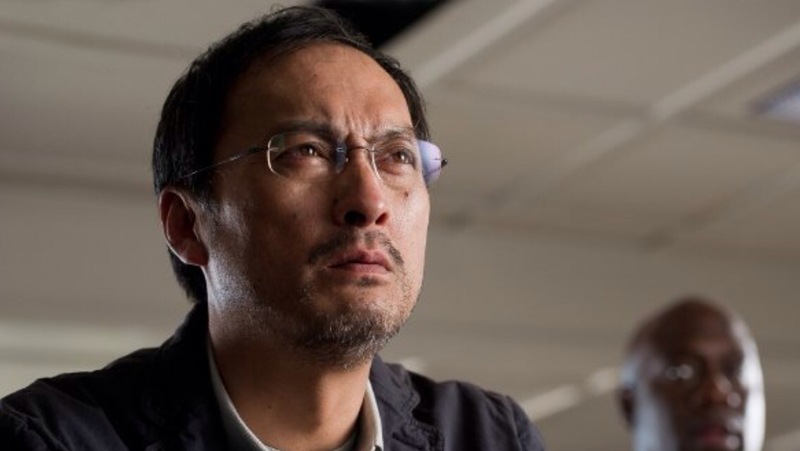 Another thing, if Ken Watanabe’s father died when the bomb hit Hiroshima he’d be about seventy years old now. The actor is fifty four and barely looks that. Tsunami coming your way? No problem. Just get behind these sliding glass doors, they are miraculously water tight and will hold back the force of the ocean. Finally we have the fact that people keep failing to notice twenty storey monsters standing right behind them and no one has stumbled across the holes they have punched in mountains or the thirty foot deep, six mile long trenches they have cut through the landscape. I can’t stand it, this film is treating me like an idiot which is rich coming from something so lazily stupid. Last week I questioned what made a great blockbuster. This one certainly has the ambition and the audience but the story is pitifully weak and the ending trite. What we are left with then is the action. Here, I will happily concede, the film delivers. There is one bit right at the end with Godzilla lets rip with his atomic blue breath that is particularly cool. Still, while this scene is the moment when they save the world, it isn’t enough to save the film. 1. Is there a female lead? 2. If that character was your sister would you respect her? 3. If your sister did those things would you proudly tell all your friends about it? 3 out of 3. The female characters are smart and proactive. An undemanding audience, easily sold on spectacle would be perfect for this film. Clearly several hundred people die but there is nothing here to upset you. Actually, anything capable of prompting an emotional response would have been welcome. I keep hearing people defend Godzilla by saying we shouldn’t expect good story and character development in a big blockbuster monster movie. Why on earth not? If audiences approach this kind of film with low expectations in that respect, happily parting with their cash to just to see a few cool effects shots then all we will get is more films like Transformers. Come on people, ask for more. It is as though Inception and The Dark Knight films never happened. Stop with the Team-Ups Already!